February 14 has finally arrived and while some may enjoy an evening of fine dining to celebrate, nothing warms our hearts more than a movie night at home. 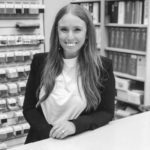 In our new blog series, Design Inspired By, we are asking our talented RJE Design Team to create spaces based on different sources of inspiration. For Valentine’s Day, we asked three of our Indianapolis designers to share designs inspired by their favorite romantic movies. 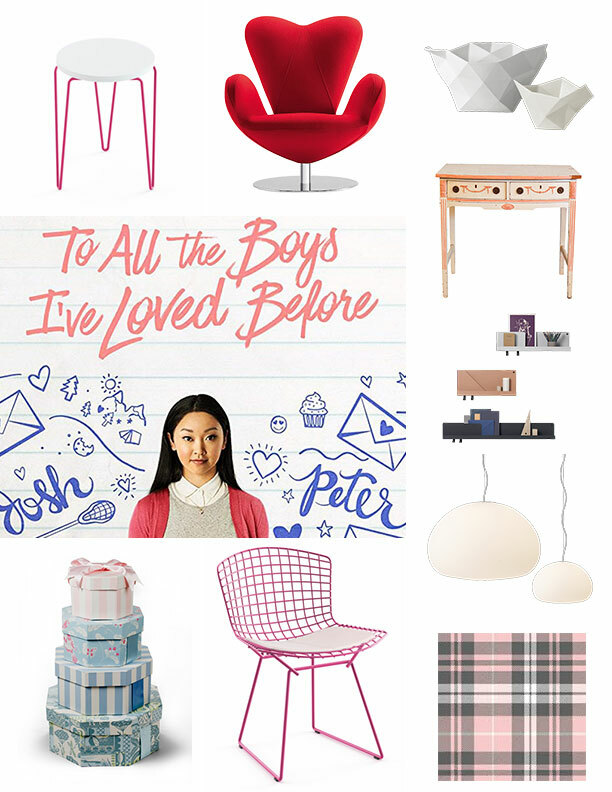 Scroll below to see which our designers loves the brat pack, the Beach Boys and a new Netflix favorite. This is one of the first rom-coms I watched growing up. It’s funny and endearing, everything a romantic comedy should be! And let’s be real – who doesn’t love a movie with Wouldn’t It Be Nice by the Beach Boys in it?! 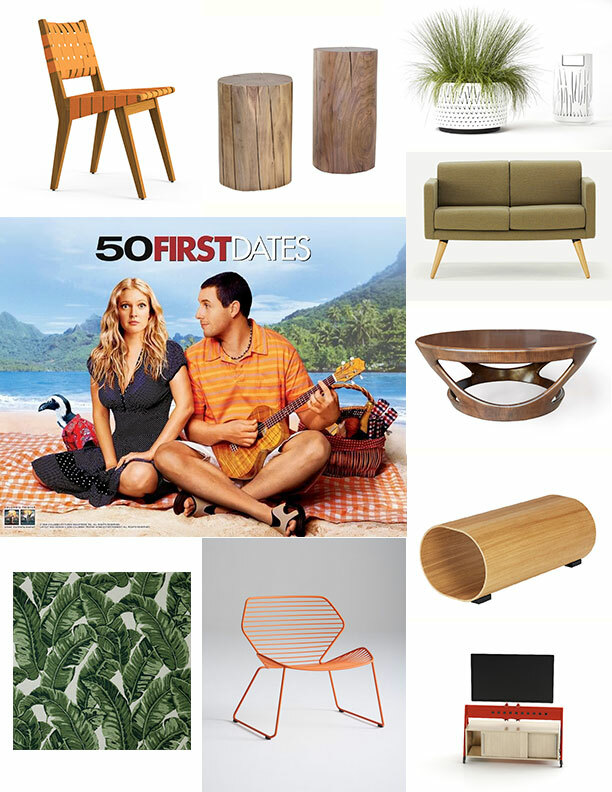 It’s practically the theme song.The furniture selections are based on the characters’ fun, colorful wardrobes and their home state of Hawaii – which is shown a lot in the upholstery and outdoor furniture pieces. I did sneak in a mobile TV cart as an ode to Henry showing Lucy her life videos every morning. Hopefully these selections have you dreaming of warmer weather with the Lucy to your Henry on chilly Valentine’s Day! Is there really better a choice in a rom-com than an 80’s Brat-Pack film? Classic, timeless and full of all the juicy drama? 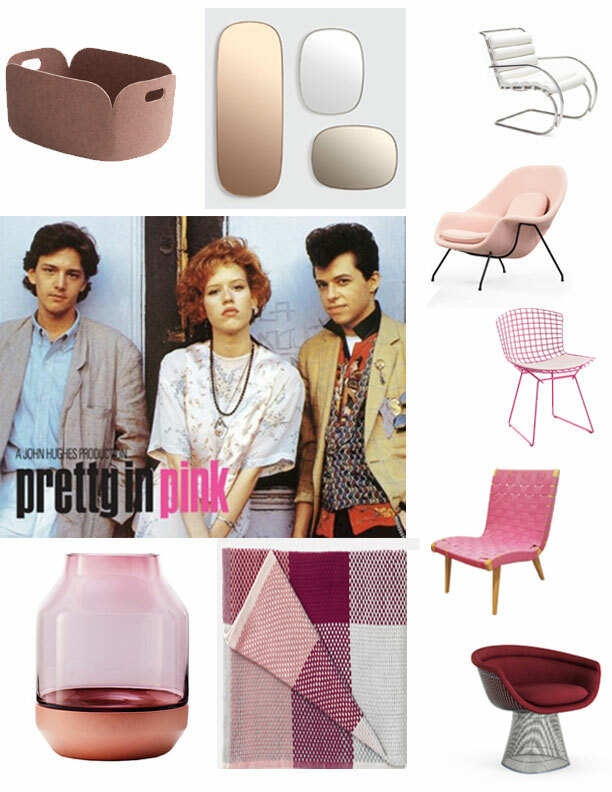 On Valentine’s Day, it’s time to get “Pretty In Pink” with some of our favorite Knoll pieces in no other color than yours truly. These pieces bring out all the stops for our favorite character, Andie. Style, beauty, detail — and we are able to bring the drama! So snuggle up in the Womb chair and grab a Loom throw with your favorite beau. I chose this movie because it is a really sweet family rom-com. We follow the main character Lara Jean’s fall-out after love letters she stored in her closet were mistakenly sent to their recipient. She is the ultimate romantic and looks to romance novels and 80’s rom-coms for advice – which makes us fall in love with her even more! The furniture selections are based off of the color scheme of the movie poster which is composed of grey, pinks and periwinkle. The swirling letters create a heart around Laura Jean, who ends up being the ultimate heartbreaker in the book trilogy, so I couldn’t resist adding the Heartbreaker Chair from Sandler Seating. A lot of the accessories resemble origami or crumbled paper as a nod to the love letters and her Asian heritage. I also added in some fun hat boxes, as that is where Lara Jean stored the infamous love letters for many years!